Son of a former minor league pitcher and baseball scout, Besana backed up Steve Bartkowski and Joe Roth as a college quarterback. 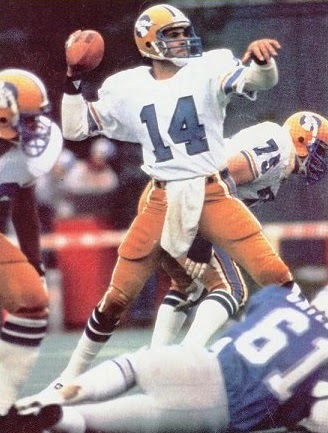 He was chosen by the Buffalo Bills in the fifth round of the 1977 NFL draft. While active for two games during his rookie season, Besana saw no action and was released at the end of the preseason in ’78. He was signed by the New York Giants late in the year and again was active for two games but didn’t play. Released by the Giants during the ’79 preseason, Besana played three years with the Twin Cities Cougars of the minor league California Football League while running a beer distributorship. The Cougars were champions all three seasons and Besana was twice named to the league All-Star team. He threw for 1433 yards and 15 TDs in 1980 and led the circuit in passing in ’82 by throwing for 1767 yards and 19 touchdowns with only four interceptions. Besana was signed by the Invaders of the new USFL just before training camp for their inaugural Spring season. Invaders went 9-9 to finish first in the USFL Pacific Division. Lost USFL Semifinal playoff to Michigan Panthers (37-21). Following his impressive 1983 season, Besana and the Oakland offense got off to a rough start in ’84. The team was 0-9 before catching fire with a seven-game winning streak. Besana ended up throwing for 2792 yards and 14 touchdowns with 12 interceptions. The Invaders were merged with the Michigan Panthers for 1985 and Besana lost his starting job to Bobby Hebert. He threw just 58 passes, completing 34 for 494 yards and six TDs along with four interceptions. The demise of the USFL brought an end to Besana’s career. For his three USFL seasons, Besana completed 60.3 percent of his passes for 7266 yards and 41 touchdowns while giving up 32 interceptions and being sacked 140 times.